The story of the discovery of novas emitting gamma rays thought previously to come only from the more massive supernovas (image), opened in Japan during the predawn hours of March 11, when amateur astronomers Koichi Nishiyama and Fujio Kabashima in Miyaki-cho, Saga Prefecture, imaged a dramatic change in the brightness of a star in the constellation Cygnus. They realized that the star, known as V407 Cyg, was 10 times brighter than in an image they had taken three days earlier. A nova is a sudden, short-lived brightening of an otherwise inconspicuous star. The outburst occurs when a white dwarf in a binary system erupts in an enormous thermonuclear explosion. On March 13, Goddard's Davide Donato was on-duty as the LAT "flare advocate," a scientist who monitors the daily data downloads for sources of potential interest, when he noticed a significant detection in Cygnus. But linking this source to the nova would take several days, in part because key members of the Fermi team were in Paris for a meeting of the LAT scientific collaboration. "This region is close to the galactic plane, which packs together many types of gamma-ray sources — pulsars, supernova remnants, and others in our own galaxy, plus active galaxies beyond them," Donato said. "If the nova had occurred elsewhere in the sky, figuring out the connection would have been easier." The LAT team began a concerted effort to identify the mystery source over the following days. On March 17, the researchers decided to obtain a "target-of-opportunity" observation using NASA's Swift satellite — only to find that Swift was already observing the same spot. "At that point, I knew Swift was targeting V407 Cyg, but I didn't know why," said Teddy Cheung, an astrophysicist at the Naval Research Laboratory (NRL) in Washington, D.C., and the lead author of the study. Examining the Swift data, Cheung saw no additional X-ray sources that could account for what Fermi's LAT was seeing. Half an hour later, Cheung learned from other members of the LAT team that the system had undergone a nova outburst, which was the reason the Swift observations had been triggered. "When we looked closer, we found that the LAT had detected the first gamma rays at about the same time as the nova's discovery," he said. V407 Cyg lies 9,000 light-years away. The system is a so-called symbiotic binary containing a compact white dwarf and a red giant star about 500 times the size of the sun. "The red giant is so swollen that its outermost atmosphere is just leaking away into space," said Adam Hill at Joseph Fourier University in Grenoble, France. The phenomenon is similar to the solar wind produced by the sun, but the flow is much stronger. "Each decade, the red giant sheds enough hydrogen gas to equal the mass of Earth," he added. The white dwarf intercepts and captures some of this gas, which accumulates on its surface. As the gas piles on for decades to centuries, it eventually becomes hot and dense enough to fuse into helium. This energy-producing process triggers a runaway reaction that explodes the accumulated gas. The white dwarf itself, however, remains intact. The blast created a hot, dense expanding shell called a shock front, composed of high-speed particles, ionized gas and magnetic fields. According to an early spectrum obtained by Christian Buil at Castanet Tolosan Observatory, France, the nova's shock wave expanded at 7 million miles per hour — or nearly 1 percent the speed of light. The magnetic fields trapped particles within the shell and whipped them up to tremendous energies. Before they could escape, the particles had reached velocities near the speed of light. Scientists say that the gamma rays likely resulted when these accelerated particles smashed into the red giant's wind. "We know that the remnants of much more powerful supernova explosions can trap and accelerate particles like this, but no one suspected that the magnetic fields in novae were strong enough to do it as well," said NRL's Soebur Razzaque. Supernovae remnants endure for 100,000 years and affect regions of space thousands of light-years across. Kent Wood at NRL compares astronomical studies of supernova remnants to looking at static images in a photo album. 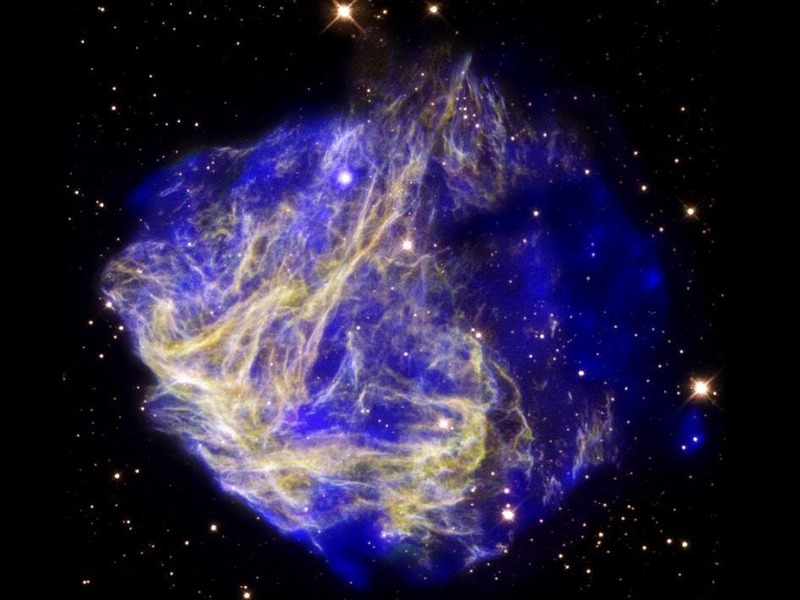 "It takes thousands of years for supernova remnants to evolve, but with this nova we've watched the same kinds of changes over just a few days," he said. "We've gone from a photo album to a time-lapse movie." "In human terms, this was an immensely powerful eruption, equivalent to about 1,000 times the energy emitted by the sun every year," said Elizabeth Hays, a Fermi deputy project scientist at NASA's Goddard Space Flight Center in Greenbelt, Md. "But compared to other cosmic events Fermi sees, it was quite modest. We're amazed that Fermi detected it so strongly." Gamma rays are the most energetic form of light, and Fermi's Large Area Telescope (LAT) detected the nova for 15 days. Scientists believe the emission arose as a million-mile-per-hour shock wave raced from the site of the explosion.